- Fri Dec 15, 2017 5:50 am #520270 This happens when I'm observing (and sometimes controlling) and I switch off a frequency and then back. It specifically occurs when I hit the HS/LS selector button on the channel. I have to close vSTARS and restart. 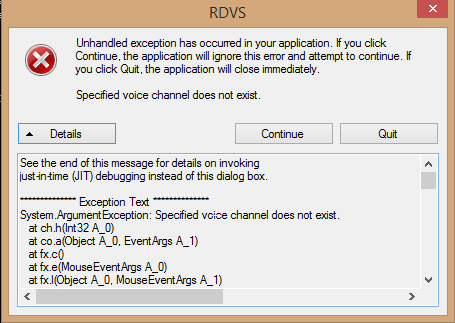 System.ArgumentException: Specified voice channel does not exist. - Fri Dec 15, 2017 5:53 am #520271 I just reproduced it by restarting vSTARS, connecting to the channel on HS and RX. Disconnected from the channel. Attempted to connect again by hitting HS. Crash. Tried also by using RX first then hitting HS and crash. - Fri Dec 15, 2017 8:48 pm #520290 Thanks, I have logged the bug report. You do not need to uninstall the previous version before installing 1.1.8. This version also enables selecting up to 400 video maps, where as the previous limit was 100.